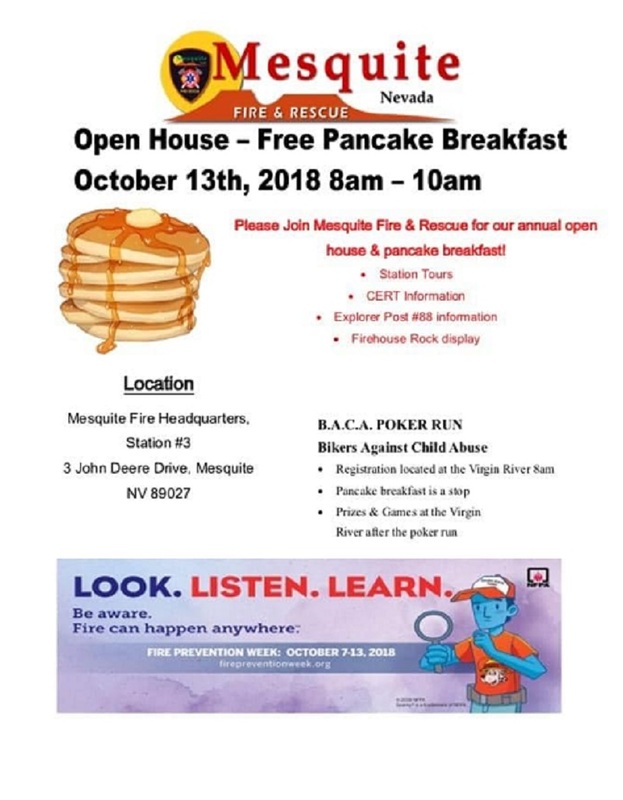 MESQUITE, Nev. — As fire prevention week comes to an end, the city of Mesquite Fire Station No. 3 invites the community to come out Saturday at 8 a.m. PDT and join in its fifth annual pancake breakfast and open house. The event started five years ago in an effort to raise awareness and bring the community together, and it was such a hit that it became an annual community event. This year’s theme, “Look. Listen. Learn. Be aware, fire can happen anywhere,” was created by the National Fire Protection Association and aims to educate residents on the three basic but imperative steps needed to reduce the likelihood of fire — and teach them what to do if a fire should occur. Look. Fire can happen anywhere. Look around your home for places fire can happen. Listen. Know the sound your smoke alarms make. Learn. Learn two ways out of every room. A Poker Run will also take place during the event, hosted by Bikers Against Child Abuse, with a scheduled stop at the pancake breakfast to support the Mesquite Fire Department. Registration for the poker run will take place at the Virgin River Hotel and Casino, 100 E. Pioneer Blvd., Mesquite at 8 a.m., and at the end, prizes will be awarded at the hotel. The pancake breakfast is free, but donations will be accepted to benefit the local high school-age Fire Explorer Post. Fire Prevention Week is observed each year during the week of Oct. 9 to commemorate the Great Chicago Fire. This horrific fire, which occurred in 1871, killed more than 250 people, left 100,000 homeless, destroyed over 17,000 structures and burned more than 2,000 acres of land. In 1925, President Calvin Coolidge proclaimed Fire Prevention Week a national observance, making it the longest-running public health observance in the country. What: Fifth annual open house and pancake breakfast. When: Saturday, Oct. 13 , 8 a.m. PDT. Where: Mesquite Fire Station No. 3, 3 John Deere Drive, Mesquite. Cost: Free, but donations are gratefully accepted.